Author Candace Simar will appear at the Little Falls Carnegie Library on Tuesday, Oct. 11 from 6:30 to 7:30 p.m. She is an award-winning poet and writer from Pequot Lakes, Minnesota, who carries a passion for Minnesota history. Her historical Abercrombie Trail series (North Star Press), recounts the story of Scandinavian immigrants during the 1862 Sioux Uprising. The fiction series includes "Abercrombie Trail" (2009), "Pomme de Terre" (2010), "Birdie" (2011) and "Blooming Prairie" (2012). 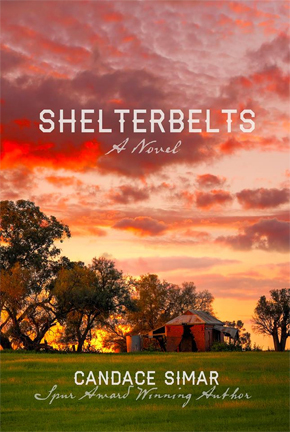 Her newest novel, "Shelterbelts," is set in a tightly-knit Scandinavian farming community struggling to return to normal at the close of WW2. Simar’s story is woven throughout with remarkable characters such as the man who walks lizards, a grieving father, the neighborhood gossipmonger, a disillusioned preacher, the man who fears being returned to the asylum and the Potato King who prays for a miracle. The public is invited to join us for this free program in which Simar will share her love of history and her research into the farms of 1940’s Minnesota. The program will include a drawing for one of Simar's books.